This assay has high sensitivity and excellent specificity for detection of Mouse ATM. No significant cross-reactivity or interference between Mouse ATM and analogues was observed. Note: Limited by current skills and knowledge, it is impossible for us to complete the cross- reactivity detection between Mouse ATM and all the analogues, therefore, cross reaction may still exist. MBS2501227 is a ready-to-use microwell, strip plate ELISA (enzyme-linked immunosorbent assay) Kit for analyzing the presence of the ATM, ELISA Kit target analytes in biological samples. The concentration gradients of the kit standards or positive controls render a theoretical kit detection range in biological research samples containing ATM. The ELISA analytical biochemical technique of the MBS2501227 kit is based on ATM antibody-ATM antigen interactions (immunosorbency) and an HRP colorimetric detection system to detect ATM antigen targets in samples. The ELISA Kit is designed to detect native, not recombinant, ATM. Appropriate sample types may include undiluted body fluids and/or tissue homogenates, secretions. Quality control assays assessing reproducibility identified the intra-assay CV (%) and inter-assay CV(%). Principle of the Assay: This ELISA kit uses Sandwich-ELISA as the method. The micro ELISA plate provided in this kit has been pre-coated with an antibody specific to Mouse ATM. Standards or samples are added to the appropriate micro ELISA plate wells and bound by the specific antibody. Then a biotinylated detection antibody specific for Mouse ATM and Avidin-Horseradish Peroxidase (HRP) conjugate is added to each micro plate well successively and incubated. Free components are washed away. The substrate solution is added to each well. Only those wells that contain Mouse ATM, biotinylated detection antibody and Avidin-HRP conjugate will appear blue in color. The enzyme-substrate reaction is terminated by the addition of a sulphuric acid solution and the color turns yellow. The optical density (OD) is measured spectrophotometrically at a wavelength of 450 nm +/- 2 nm. The OD value is proportional to the concentration of Mouse ATM. 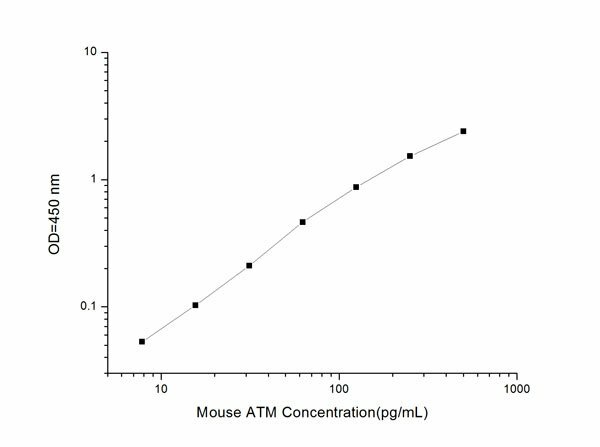 You can calculate the concentration of Mouse ATM in the samples by comparing the OD of the samples to the standard curve. ATM: an atypical kinase of the PIKK family. Regulates cell cycle checkpoints and DNA repair . May function as a tumor suppressor. Activates checkpoint signaling upon double strand breaks (DSBs), apoptosis and genotoxic stresses such as ionizing ultraviolet A light (UVA), thereby acting as a DNA damage sensor. Involved in the activation of ABL1 and SAPK. Binds DNA ends and is part of the BRCA1- associated genome surveillance complex (BASC), which contains BRCA1, MSH2, MSH6, MLH1, ATM, BLM, PMS2 and the RAD50-MRE11-NBN protein complex. This association could be a dynamic process changing throughout the cell cycle and within subnuclear domains. DNA damage promotes association with RAD17. LOF mutations associated with ataxia telangiectasia, causing progressive loss of motor control (ataxia), dilation of superficial blood vessels (telangiectasia), cancer and immune deficiency. Approximately 30% of cases develop tumors, mostly lymphomas and leukemias, due to defects in DNA damage repair. Somatic mutations seen in leukemias and lymphomas. 1. Huntington's disease cells presented a delayed nucleo-shuttling of phosphorylated forms of the ATM kinase.